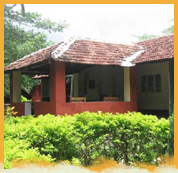 ungle Inn is located in Veeranahosahalli, Karnataka on the northern fringe of the Nagarhole National Park. This park, also known as the Rajiv Gandhi National Park admeasures 643 sq. kms. Jungle Inn is right next to the main entrance into the park, 68 kms. from Mysore on the Hunsur-Nagarhole road. The nearest town is Hunsur, 20 kms. away, which is a convenient place for fuel and supplies. Jungle Inn has cottages with 7 private rooms and 3 dormitories. Jungle Inn can house 38 people in all, 2 per private room and 8 per dormitory. All the rooms have attached bathrooms and each dormitory has two attached bathrooms. Apart from cottages, Jungle Inn offers our guests the experience of staying in a tented facility within our premises. Tents have all the facilities available in the cottages. Guests are served food at thatched Gudara. We serve European and Indian food. Menu is specially designed to cater to the tastes of both vegetarians and non-vegetarians. Vehicles owned by the resort are provided to the guests for safaris.. This makes sure that the guests are taken for safaris with lesser crowd and that they get personal attention. This would help guests to have a better chance of game sighting. "Minimum inconvenience and maximum comfort" for our guests is what we strive at. The inn provides several activities including wildlife drives, camping, trekking, a tribal dance, a visit to a coffee plantation as well as a Tibetan monastery and a ride in a coracle, a traditional saucer shaped boat made from bamboo and tanned buffalo hide. Remote, scenic, comfortable and hospitable are the best words to describe Jungle Inn.